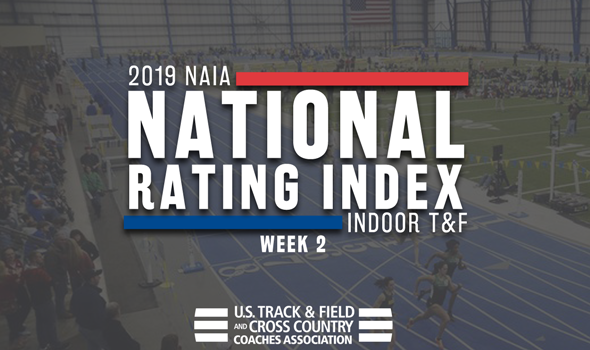 NEW ORLEANS – There was some shuffling in the ranks of the NAIA Men’s and Women’s Indoor Track & Field National Rating Index between Week 1 and Week 2. Four teams in the men’s top-5 and two teams in the women’s top-5 shifted spots as the season picked up some steam. Remember: The 2019 NAIA Indoor Track & Field Championships will be held between February 28 and March 2 in Brookings, South Dakota at the Jackrabbit Athletic Complex. Indiana Tech remained No. 1 once again and strengthened its spot atop the TFRI. The Warriors’ 4×800 team clocked the fifth fastest time nationally, while Coby Bailey notched the seventh best time in the 60. Concordia (Neb.) made quite the jump as it is now ranked No. 2 after being ranked No. 6 in Week 1. The Bulldogs received a quartet of top-4 national marks this past weekend thanks to Josiah McAllister in the 1000 (1st, 2:29.93), Coby Williams in the heptathlon (2nd, 5096), Jacob Cornelio in the weight throw (4th, 19.80m/64-11½) and the 4×400 relay team (4th, 3:20.04). Doane (Neb.) moved up two spots to No. 3 after a busy weekend. Julius Dickmander moved up to seventh nationally in the heptathlon, while Alan Varela and Simon Rangel are now ranked eighth in the 600 and weight throw, respectively. MidAmerican Nazarene (Kan.) fell to No. 4, while Saint Mary (Kan.) jumped from No. 10 to No. 5. The Spires were propelled by the nation’s top-ranked DMR team (10:16.61) and Phillip Langemann, who is now ranked second nationally in the mile at 4:15.57. Indiana Tech is still No. 1 and helped its own cause a bit. The Warriors watched as Antonishka Deveaux and Lenea Ludy moved into the top-4 nationally in the 200 and high jump, respectively, to give the team 12 entries in the top-4 so far this season. Concordia (Neb.) kept pace thanks to the efforts of Samantha Liermann, who launched the shot 14.33m (47-0¼) to move into fourth place nationally in the event. Liermann and Adrianna Shaw provide the Bulldogs with a solid 1-2 punch in the throws. Cornerstone (Mich.) jumped into the top-5 for the first time this season, coming in at No. 4 right behind Doane (Neb.). The Golden Eagles received top-5 national marks from the DMR team (2nd at 12:20.61), Kelli Smith in the mile (3rd at 5:06.80), Valerie Richter in the mile (4th at 5:09.54) and D’Amaie Davis in the 3000-meter race walk (5th at 16:55.40). Aquinas (Mich.) rounded out the top-5 this week after it received four top-4 marks from athletes, headlined by the 4×800 relay team which is now ranked third nationally. The Saints climbed two spots from Week 1, when they were billed seventh.